The 2011 Mac Mini is blowing away early benchmarks, in some cases doubling their predecessors and even outperforming the impressive MacBook Air 2011 benchmarks. Not bad for a tiny Mac are they? Unsurprisingly, the Mac Mini Core i7 model is the most impressive, with a whopping 9573 GeekBench score, but the Core i5 is no slouch at 6395. With the 2011 Mac Mini performing so well, it looks like the hardest decision many prospective buyers will have to make is exactly which model they want to fly with, but the Quad-Core i7 Server model is a certified screamer. We’ll update as we get more benchmark results and hopefully we can see some real-world tests soon too. 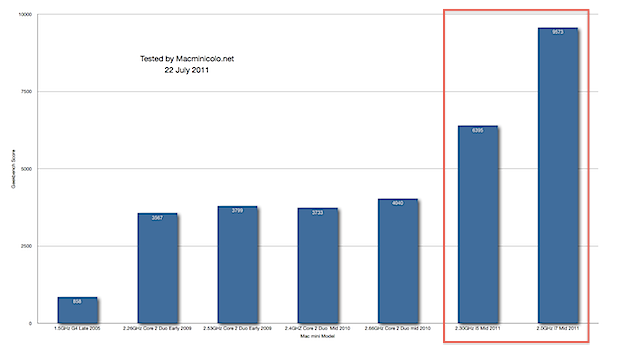 MacBook Pro 2011 Benchmarks are Insane: Faster than Mac Pro! Wow! I’m sold. Always been a fan of the Mac mini and now it makes for a great powerful desktop. One problem with the server grade Mac Mini though…. It uses an Intel 3000 HD integrated graphics card that BALOOWS. And as far as I know, has horrible compatibility for gaming. Where as the 2.3 Dual Core Mac Mini has a dedicated graphics card produced by AMD and has 256MB of GDDR5 memory. If you want to play games, I don’t know how well the Mac Mini Server is going to going to help you to do that. These performance results are very tempting. But the artical that this i7/i5 MacMini is being compared to only MacBook Air i5 and not the i7 which we still have not seen benchmarks for as yet. I’m more curious with the direct comparision i7 13″ MBA, i7 13″ MBP and i7 MM! I got the mid-range model … mostly because I really wanted the dedicated graphics card. The scores on the i7 server almost make me regret that though, especially since for $200 more it comes with an extra 500gigs and the $50? Lion server apps.